The UK has a hugely active alternative lending and equity investment market with over a thousand providers on offer, but 50% of SMEs only contact 1 funding provider when looking for funding – most small businesses are not discovering or comparing the best sources of finance out there for them. And the reason for this, has often come down to the time it takes to do so. 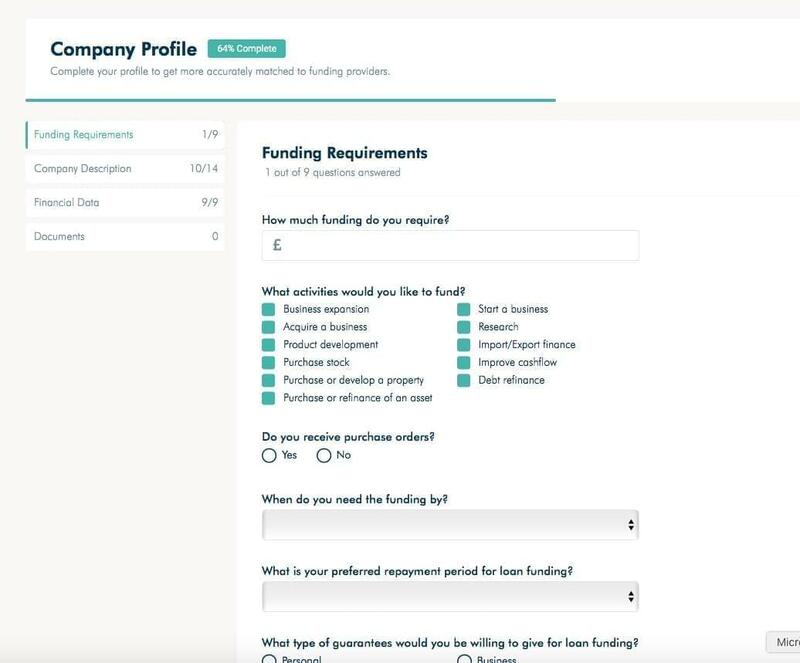 So, Swoop has launched an intuitive funding system that allows you to not only match your clients’ businesses with funding solutions who can provide the finance they need, but also with those who have a proven track record funding similar sized businesses within their sector. By enabling you to use Swoop, your clients will benefit from dealing with funding providers who understand your client’s sector and have deep experience in providing capital solutions to businesses just like your clients. Swoop works with hundreds of funding providers across debt and equity to provide your clients with comparative funding solutions in minutes. We know how painful and time-consuming accessing financing can be for SMEs, so with Swoop you can easily support your clients with the process. Use your Swoop dashboard to keep track of your clients funding progress as well as getting regular updates from the Swoop team every time the next step of their application has been completed. Which of my clients are a good fit for Swoop? On the debt side of our business we are very comfortable raising debt between £25,000 to £2,000,000 with the average deal size around £250,000 but our lenders’ funding solutions range from a minimum of £10,000 to a maximum of £30m. On equity our average ticket size is £800,000 and have funding partners ranging from £100,000 – £50m. We have a live chat function on Swoop, so you can discuss in real-time with our team any questions you have. Or just pick up the phone, and one of our team will be happy to help. 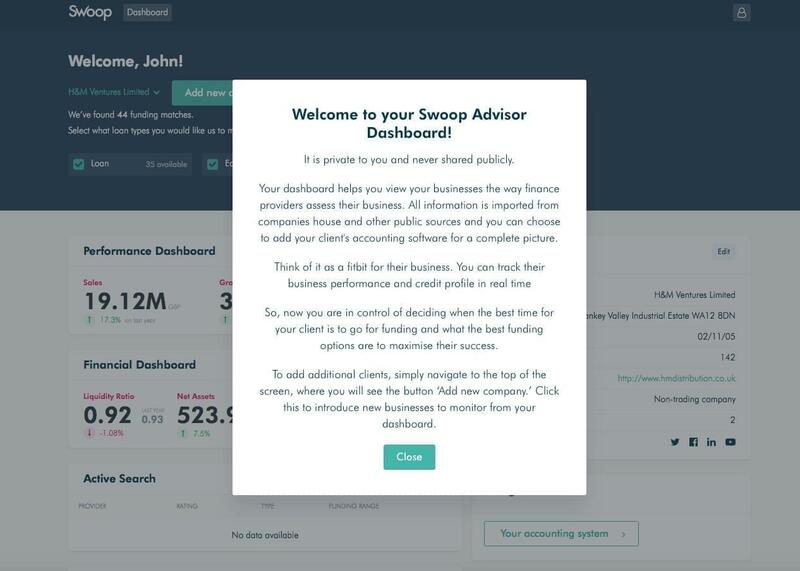 Once you have created your advisor account on Swoop, you will be taken to your Swoop Dashboard where you will be able to onboard and manage your clients funding needs. 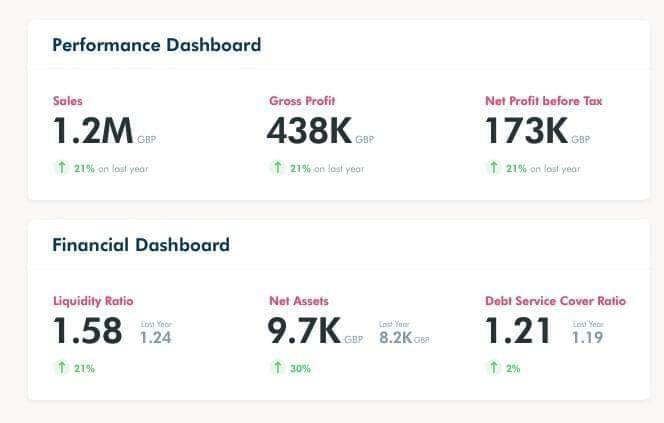 Each client will have their own Swoop Dashboard where you can review their performance and financial metrics across turnover, profitability, assets, debt service coverage ratio, liquidity ratio. 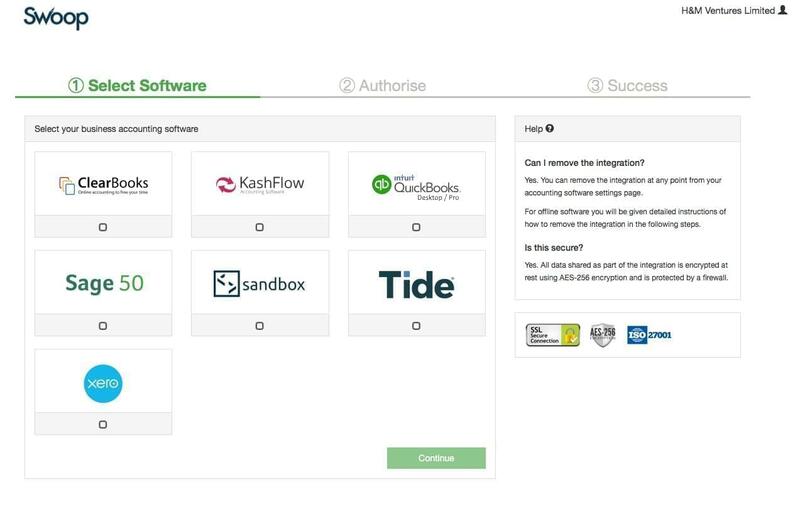 Swoop integrates with companies house and every major accountancy package, so you will be able to on board every client within a few minutes and pull all their essential financial data into one dashboard. From the dashboard, you will be able to run funding searches across loans, equity and grants. Once you see a funding solution that is a good fit for your client, you can submit it for a review with Swoop where we will qualify the deal. If the deal is qualified, we will take it forward to our funding provider for your client and manage the deal for you. Once the deal has been approved you will then receive 10% for any fees we receive from the deal. What funding types does Swoop support? To start managing your clients’ funding solutions through Swoop, sign up here or if you would like further information about the platform you can get in touch here.